MARK CLARKSON. There is reason to believe that Mark Clarkson is the father of John Clayson. Alternative versions of the surname were recorded in different parishes and at different times. Mark was the son of Mark Clarkson and Angelica. He was the middle of three surviving children, an earlier Mark having died. This second Mark was baptised at St Mary Magdalen church in Denton on 17 February 1674, in the reign of Charles II. Denton is a village between Canterbury and Dover. He appears to have moved to nearby Barham before he married. The wedding took place in Barham and the couple brought up their children there. Barham is a picturesque village in the North Downs. March 9 Bapt Bennet Page virgin aged 17 years. The word virgin was used to mean a single woman. There is no mention of her parents. This would mean that she was born in 1666, the year of the Great Fire of London, or early 1667. Why was Bennet not baptised as an infant? What prompted her to seek baptism now? How did she, or others, know that she had not been baptised? Womenswold is a small parish to the east of Barham and Denton. It consists of three hamlets. Bennet is the first Page to appear in the Womenswold registers. It is more than a century before there is another. Since she is not stated to be from another parish she may have been working in Womenswold. Or she may have been baptised away from her home parish to avoid comment. It could be that her parish priest had discovered she had not been baptised and insisted that she rectify this. She is probably the same Bennett Page who was married in the neighbouring parish of Barham in 1696. It is possible that she was not baptised as an infant because her parents were Baptists. The 17th century had seen a religious upheaval. The ascendancy of the Puritans under Cromwell opened the way for dissenting churches such as the Independents and the Baptists. The Baptists do not practise infant baptism, but wait until someone is old enough to make the promises for themselves. At the time of her marriage to Mark Clarkson in Barham in 1696, Bennett Page was said to be “of this parish”. She is only the second Page in the Barham registers. The previous one was the burial of Allice Page in 1671. Her marriage was followed the same year by the burial of Bridgett Page widow. It is possible that Bridgett was her mother. This is followed by a succession of baptisms for the children of Joseph and Margrett Page, starting in 1706. Among them is a daughter Bennett and a son Josias. Neither Joseph’s baptism nor his marriage has been found. It is possible that he was her brother, and that the family moved to Barham in the late 17th century. There is a possible marriage for the widow Bridgett Page who died in 1696. In 1646 Josias Page married Bridget Ladd at Thanington just south of Canterbury. The groom was of Canterbury St Mildred and the bride of Canterbury St Andrew. Her father was a gentleman, probably a woollen draper. The early years of their marriage would have coincided with the spread of Baptist beliefs in Canterbury. They had only one child baptised in Canterbury, Mary in 1647. If the Pages converted to Baptist beliefs after the first phase of the Civil War, we should not expect to find further infant baptisms. The link to this marriage is supported by the fact that both Bennett and Joseph had sons named Josias. A 1646 marriage is rather early for Bennett’s birth in 1666, but not impossible. We do not know when and where Josias died, nor when the Pages left Canterbury. If the Allice Page buried in Barham in 1671 is part of this family, then Bennett would have moved there as a very young child, or been born there. The burial register gives no information about Allice’s parents or her marital status. She is likely to have been an adult, and may be Bennett’s older sister. If she was not related, then the move would have been before Bennett’s baptism in Womenswold in 1683. She was resident in Barham at the time of her marriage in 1696, when she would have been 30, if the Womenswold identification is right. This early history is conjecture, but it is consistent with the available evidence. It would explain why Bennett and the widow Bridgett Page make their first entry in the Barham registers in the same year. Mark and Bennett married at the church of St John the Baptist, Barham, on 25 June 1696. By now Charles II had been replaced by the Protestant monarchs William III and Mary II. Queen Mary had died two years previously, leaving William to rule alone. Bennett was several months pregnant when she married. Mark, 11 April 1698. This Mark, son of Mark, died at the age of 18. He was buried in Barham on 21 Nov 1716. The following year, Vincent died unmarried. He was buried in Barham on 6 February 1731. In 1732 John married Sarah Erridge at St Margaret’s in Canterbury. They started their family in Barham, but then to moved to Walmer, next to Deal. William died in 1736. His will names his wife Ann and his father Mark, to whom he leaves all his property. The making of a will suggests that the family were not amongst the poorest. Both Mark and Bennett died in 1741 and were buried in Barham, Mark on 5 April at the age of 67, and Bennett on 18 July at 77, if we have her birth date right. 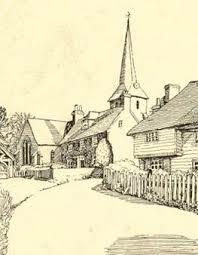 Genealogical information from Findmypast: Canterbury Archdeaconry records. Additional information from Brenda Hopkin.